Java by examples: How to get list of opened JFrame in Java Swing? How to get list of opened JFrame in Java Swing? JFrame can be accessible by its parent. 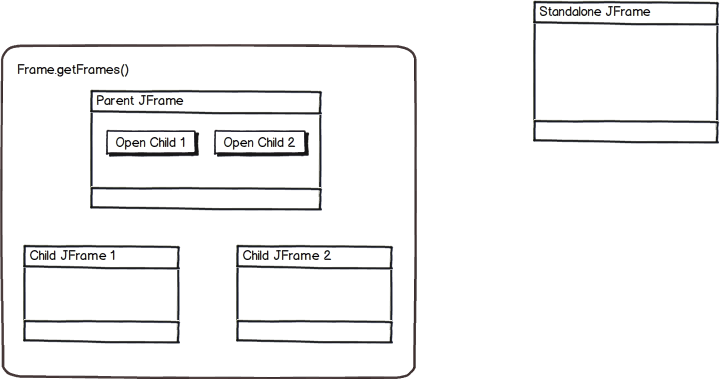 As you can see I created boundary around Parent JFrame, Child JFrame 1 and Child JFrame 2. 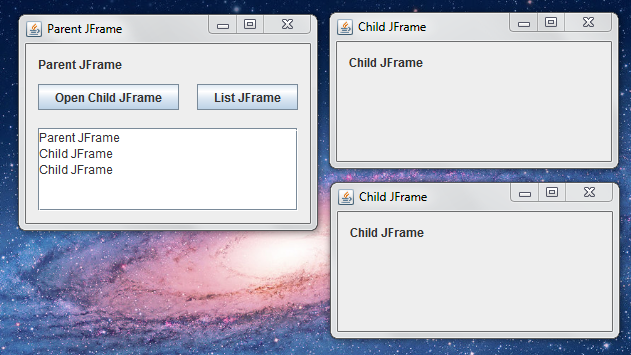 It means you can access list of JFrame initiated by ParentJFrame. You can't access Standalone JFrame in Parent JFrame. This method will return list of all Frame Object created by its parent and parent it self. I used NetBeans to create sample code. I explained code that relate the title of article. Major code done only in Parent JFrame. Child JFrame only supports example.